A family of four … that’s move-in ready… and is just large enough without being overbearing... that possesses fully modernized, mid-century charm... for an absolute steal in this part of town… considering it’s the only "ready-to-go" single-family house in this school district priced below $400k, at the moment. One or two parents who are employed with Emory or CDC. A smart kid who will excel in the aforementioned top-notch school district. Proximity to a bustling, ultra-convenient commercial district… not to mention to the center of Decatur… and, for that matter, to the I-285 Perimeter. If you’ve checked “I want that” to couple or more of these boxes, then you’ve got to see this place. Trying to buy just the right home in Decatur is a challenge. Downright frustrating in many cases. Those reports of over a "thousand people a month" moving Intown are true, and City of Decatur inventory is at an all-time low. Many buyers are left with the feeling they will have to snap up almost anything that pops up or be left behind. If you've had the discipline to wait for the ideal home to appear, your patience may be rewarded here. The address is 600 N Superior Ave., Decatur, GA. 30033. The price is $399,900 (recently appraised at $417,000). Right on the northern edge of the City of Decatur sits a sweet little 1956 ranch home — three bedrooms, two baths, 1,344 square feet, and a super-sized yard that’s large enough to accommodate tossing a frisbee around without having to worry about trampling on the garden. You get the idea. But there are a few things to get out there right off the bat. To start, this home has been completely modernized with all of the amenities one might expect in a lovingly maintained 21st-century adaptation of a mid-century classic: nicely knotted caramel-colored hardwood floors throughout; some ultra-practical built-in shelving; stainless appliances in the newly remodeled kitchen (and yes, granite countertops, in case you were wondering (not to mention some really lovely custom cabinetry); and an attention to modularity that will allow your own personality to rear its head without clashing. The color palate is easy-going already, but have a hand at it if brighter schemes are more your taste. While we’re on the subject, let’s take a moment to spell out the other highlights of the floor plan. There are a multitude of closets in this home, so places for your stuff are waiting. 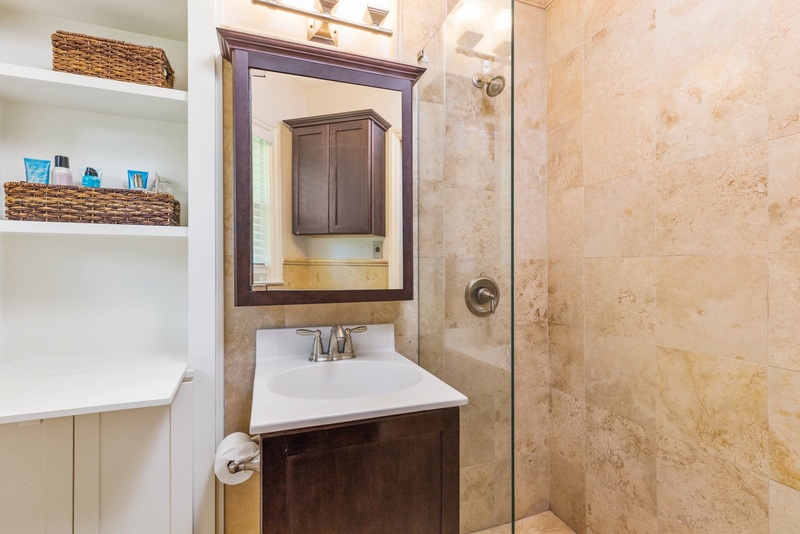 The bathrooms have left nothing to chance — ranch homes, for some reason, tend to maintain bathrooms for much longer than trend allows, but that’s not the case here. Both have been totally updated with some amazing fixtures and earthy tilework. Even the doors are spot-on. Heavy wood. Thick. Sturdy. The kind that results in a resistant, knuckle-biting rap when you knock on them. Second. When we say "edge of City of Decatur,” we mean inside the line. In other words, you’ve got carte blanche access to the best schools in the area: Clairmont Elementary, Renfroe Middle, and Decatur High have long been the envy of Atlanta academia, and many a family have moved to this part of town solely for the second-to-none school district (not to mention the fact that Decatur is bafflingly charming, with an abundance of opportunities in the realms of dining, entertainment, shopping, natural beauty, and awesome neighbors). Classes start in August, so no time to lose, as they say. In short, if you’re looking for a single-family house that allows such membership, you are going to be hard-pressed to spend less than $600K, let alone under $400K. 600 N. Superior, in that regard, is a rarity. So, some quick geography. 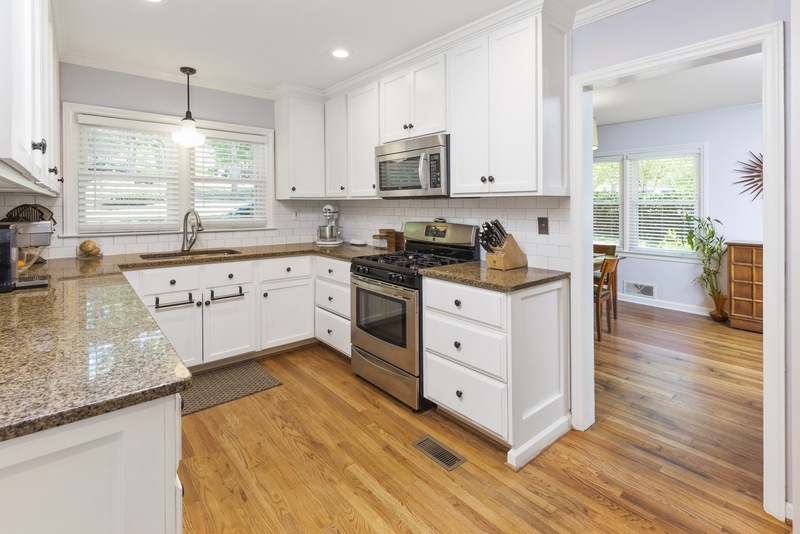 The home is situated on the northwest intersection of Superior Avenue (a quiet side street) and N. Decatur Road (a bustling thoroughfare), which allows by foot access to a commercial district. Forgot an onion for dinner? Publix is about five minutes by foot. As far as the workweek is concerned, the location couldn’t be any more ideal for a family that has connections to two of the city’s largest employers — the Centers for Disease Control and Prevention and neighboring Emory University are hardly a mile away, due west on N. Decatur Road. For those who work outside the city (Sandy Springs or the airport, for instance), the I-285 Perimeter is a short distance to the east. Same goes for Decatur’s heart, just a short way to the south. It’s easily drivable, but if you’ve got a beautiful afternoon at your disposal, take advantage of it — walking south on Superior Avenue will land you in Decatur Square in about 20 minutes, if you’d care for a stroll through some attractive, tree-strewn neighborhoods. This lawn is huge — much larger than it needs to be, to be completely honest. So, over the years, a series of owners have made their own capital improvements, and the result balances out nicely. Close to the home, and in the very back of the yard, a thick covering of old-growth trees dominate, granting some shade. 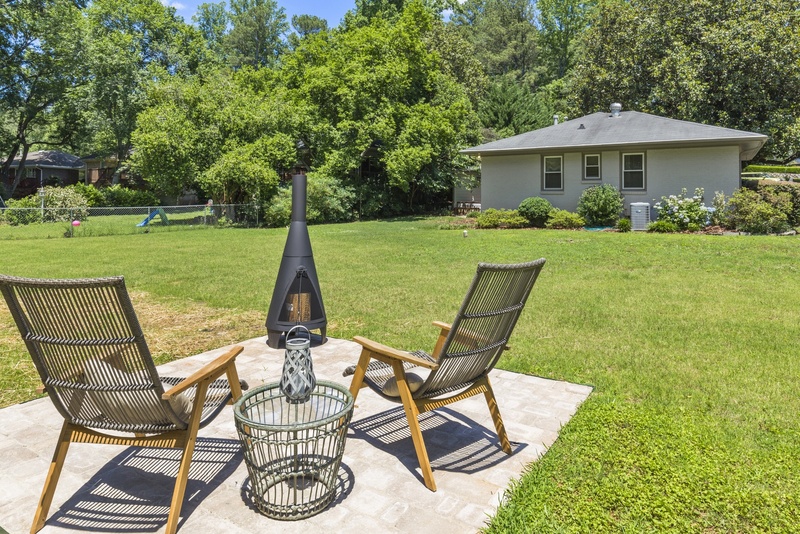 The center of the back yard, however, consists mainly of a well-maintained lawn that’s anchored by a separate, fire pit-ready sitting space. Hence the previous comment regarding frisbees and gardens (there’s plenty of room to grow your own veggies). In the back of carport, there is finished mini-shed that we just have to mention. It’s about 100 square feet all by itself, so… what do you want to do with it? Separate crafts space? Man cave? She shed? Music Studio? We'll leave it up to you, but there’s nothing too horrible about having a little extra (sound proof) space included in the whole shebang. Especially one whose walls were covered mass loaded vinyl before fire rated sheetrock (you can play a drum set in that room with quiet in the house). And just outside, one of a number of opportunities on the property for some lounging space. We’d recommend a hammock or two. 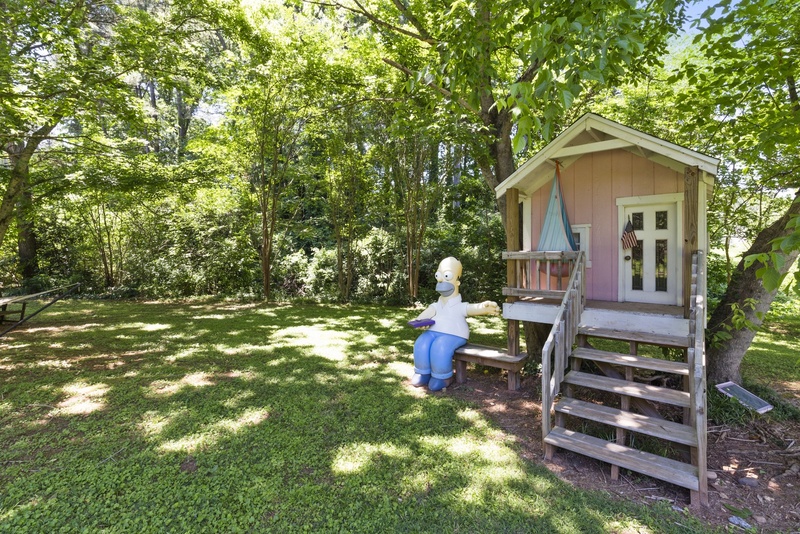 Oh, and for what it’s worth: there’s totally a life-sized Homer Simpson sitting on a bench in front of the pink, de facto treehouse — installation art or homage to popular culture? Whatever. It’s just fun. You might have to keep him, though — he’s pretty famous in this neighborhood. There’s a lot of love in this house. The current owners have lived here for only a short time, but are putting it back on the market; they’re taking in an elderly family member and need a bit more space, so we wish them the very best. As for this home’s new occupant? 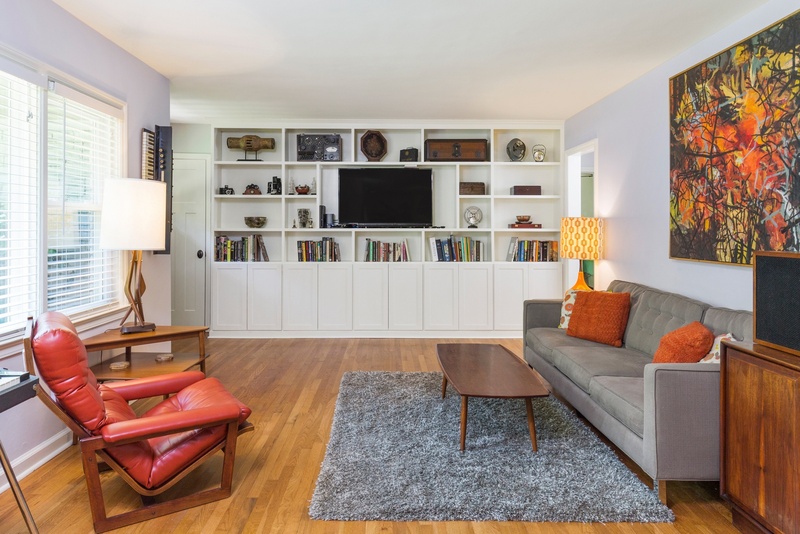 We imagine they’ll find a sense of satisfaction in the well-articulated combination of qualities that give this home an “active vibrancy:” location, construction, and modernization aside, there’s something timeless, playful, and cozy about 600 N. Superior Avenue. What are you waiting for? If you're in the market (or know someone who is), get to this home right way because Decatur area prices are up the last 42 months in a row. This unit won't last long.